Comfortable brace provides superior protection and support with unique features to maximize comfort and performance. Mueller&apos;s exclusive moisture-wicking HYDRACINN fabric which is latex-free and neoprene-free. Secure stirrup straps and longer elastic crossing straps provide exceptional support via a heel-lock and figure 8 configuration. Revolutionary, permanently bonded antimicrobial barrier provides protection against odor causing bacteria, fungus and other microorganisms. Dynamic figure 8 straps add tension as the ankle moves for even more support and a secure fit. 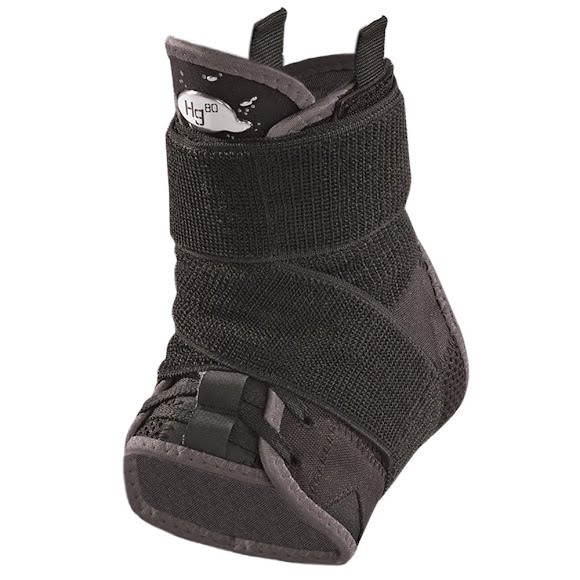 Brace is lightweight, extremely soft to the touch and comfortable. Includes free nylon mesh laundry bag to shield clothing from hook loop straps in gym bag or washing machine.